Join Lisa on Mondays, September 10, 17, & 24 from 2-4pm. $85 plus materials. 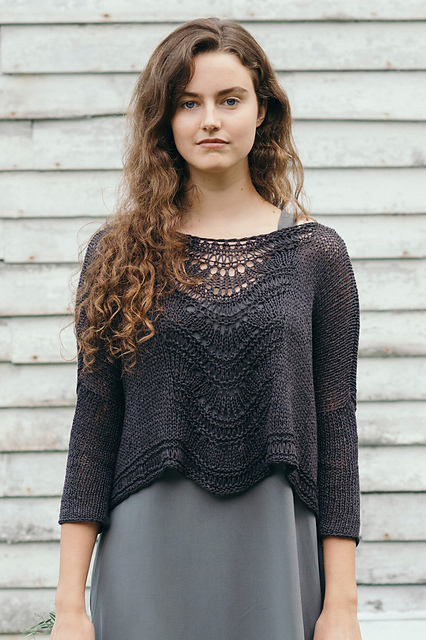 The Deschain pullover is an easy oversized top with striking textured lace. Designed with plenty of ease for a relaxed fit, this cropped boxy pullover is worked flat and then seamed, with slim sleeves picked up and worked in the round down to the cuff. Dropped stitches update the classic shale lace motif gracing the body’s front and hem. The top can be made longer by adding repeats of the shale lace pattern. Deschain would make a great summer top in linen or cotton, or a more substantial one in wool or alpaca. This class will cover techniques including picking up stitches, increases, decreases, yarnovers, and mattress stitch seaming.